Sitting in front of a screen for hours on end is easy to do, but hard on your body. 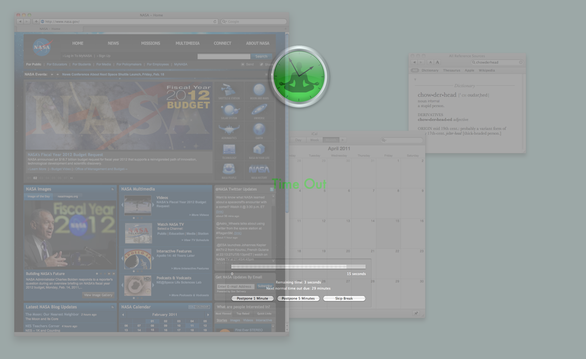 Time Out Free (Mac App Store link) is an application that knows what’s best for you, and it thinks you and your glorious 27-inch iMac should spend some time apart. The utility reminds you to take regular breaks throughout the day so that you can stand up, stretch, walk around, rest your eyes, and give your brain a breather. And since it knows how stubborn you can be, Time Out forces you to take those breaks by washing out your entire screen—in the color of your choice—when it’s time. Time Out provides two types of scheduled breaks, normal and micro. By default, a normal timeout is 10 minutes long and happens every hour (so you get 50 minutes of work and 10 minutes of rest each hour), and a micro break is just 10 seconds, but occurs every 10 minutes. You can adjust the frequency and duration of these breaks, as well as how long it takes for your screen to fade in and out—and how opaque the screen ends up. Time Out is also smart about breaks. If you’re already away from your computer (in other words, if Time Out doesn’t detect any activity), the application tracks how long you’ve been idle and counts that time as a break. If you’re right in the middle of an important task when a break starts, you can postpone the break for one minute or five minutes, or you can skip it altogether. You can customize these time options or, perhaps more prudent, remove them altogether to keep yourself from cheating. Since we previously reviewed Time Out, back in 2005, the developer has added a number of new features. You can now have Time Out automatically run Automator workflows, AppleScripts, Python scripts, or applications at the start and end of each break—for example, you could configure Time Out to automatically start playing music in iTunes at the beginning of a break and stop at the end of the break, or to change your iChat status message to Away during the break and back to Available when you start to work again. You can also have Time Out play a specific audio file at the start of each break (and stop playing, if still playing, at the end of the break); and you get more options for customizing each type of break. Time Out takes over your screen when you need to take a break.